"Find Luxury 2 & 3 BHK in Zirakpur? Highland Park Zirakpur Homes provide luxuries Aminities Like Earth Quake Resistant, Huge Discount offers Available.At the Highland Park Zirakpur , you’re always surrounded by nature with pocket parks, open spaces, and the lush greenway that brings nature right your doorstep, making the community perfect for nurturing the relationship with your family and friends.Wake up to the sunrise hues and give yourself an adrenaline rush with a game of badminton or swim in the blues for a perked up day at work. Witness all these modern innovations and various other that have been styled for you. 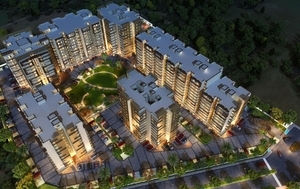 Highland Park is one of the residential joint developments of APS Group and Ubber Group. It offers 2, 3BHK and studio apartments that are equipped with all the latest amenities. The project has acquired an area of around 8.37 acres and the saleable area ranges from 1060-2190 sq. ft."